Missouri entered the Union as the 24th state on 10 August 1821. Historically, it was the launching point for America’s westward expansion: the Oregon Trail, Pony Express, and Santa Fe Trail all started in Missouri. This historic role Missouri played as America’s portal to the West is commemorated by the famous Gateway Arch monument in St. Louis. An interesting feature of this geographically-varied state is that it is adjacent to the confluence of the nation’s three greatest rivers: the Mississippi, Missouri, and Ohio. 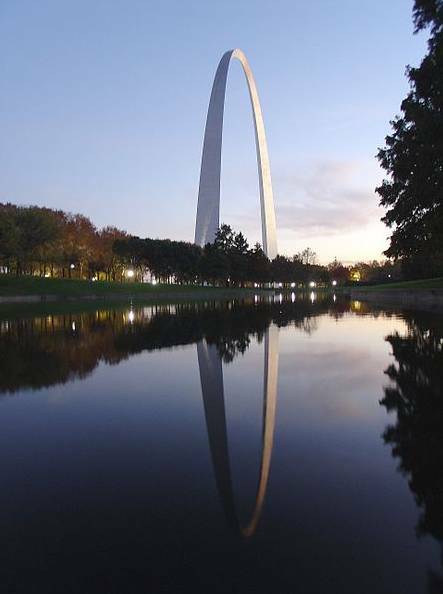 Photo: Gateway Arch, St. Louis, Missouri. Credit: Matt Kozlowski; Wikimedia Commons. If you are researching your ancestry from Missouri, you will want to use GenealogyBank’s online Missouri newspaper archives: 92 titles to help you search your family history in “The Show Me State,” providing coverage from 1808 to Today. There are more than 10 million newspaper articles and records in our online MO archives to trace your family tree! Dig deep into the online archives and search for obituaries and other news articles about your ancestors in these recent and historical MO newspapers online. Our Missouri newspapers are divided into two collections: Historical Newspapers (complete paper) and Recent Obituaries (obituaries only). Here is our complete list of online Missouri newspapers in the archives. Each newspaper title in this list is an active link that will take you directly to that paper’s search page, where you can begin searching for your ancestors by surnames, dates, keywords and more. The MO newspaper titles are listed alphabetically by city. You can either print or create a PDF version of this Blog post by simply clicking on the green “Print/PDF” button below. The PDF version makes it easy to save this post onto your desktop or portable device for quick reference—all the Missouri newspaper links will be live. More Issues of the Kansas City Star Available in Our Online Archives!